This entry is a special one. It’s a draft version of a chapter from the book I’m writing, note I said draft copy. The book is essentially taking the Memecards, like the one below, that I’ve become known for and expanding on them. I am considering having the memecards printed on actual cards to be sold with the book. 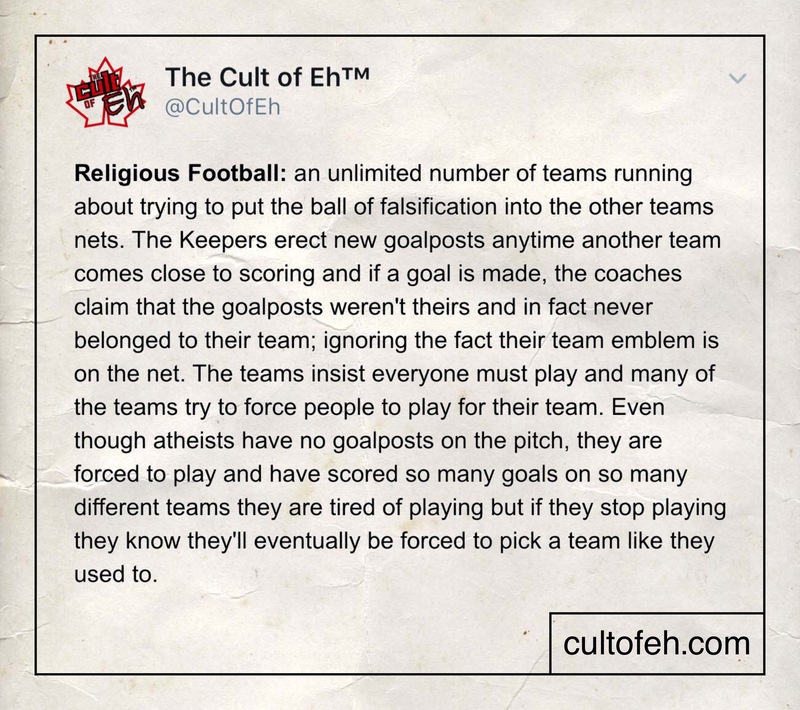 Astute Cultists will notice the Memecard below is different than the original Religious Football card I made. The original was made a long time ago and upon rewriting it to put the new logo on it I felt it needed some tweaking. As always, comments and thoughts are welcome, and I don’t mind if you point out grammatical or spelling errors since it is s draft version. First, for any North American readers, I’m discussing what we call Soccer. The rest of the world calls it Football, so that’s what I went with. Plus it sounds better than “Religious Soccer”. This is essentially just a metaphor for the aforementioned Argument from Multiple Faiths. Throughout history, there have been countless different god claims from cultures all across the globe (sorry flat-earthers). Many of these claims have changed drastically over the years. In fact, it could be argued that all of the gods still worshipped today are likely just modified versions of past gods. This is a highly debatable subject, so I’ll leave it at that. What we do have, are examples of past claims being modified to try and overcome sound logical counter-arguments, which essentially creates a new god. For example, in the Old Testament, there are many stories of God directly talking to humans and interfering with them. Stories like The Great Flood, The Burning Bush, hardening Pharaoh’s heart, The Tower of Babel, parting the Red Sea, and telling Abraham to sacrifice his son and then stopping him. I’m going to assume you are familiar with these stories, and if you aren’t, I’ll leave it to you to become familiar with them. However, complete familiarity with them is unnecessary, you just need to understand that the crux of them all is that God directly intervenes in Human affairs.Then along comes philosophers who argue against the existence of an All-Loving God based on the evils found throughout the world. This is called the Problem of Evil or the Argument from Unnecessary Suffering in its more modern version; yes, counter-apologists are forced to alter their counter-apologetics when theists move their goalposts. I will address the Argument from Unnecessary Suffering in more detail later, but it essentially says, an all-loving God can’t exist because he would not allow evil/unnecessary suffering. Seems pretty logical. As a father that loves his children, I would put down my own life to prevent my children from unnecessary suffering. Now consider that I’m not an all-loving being nor am I omnipotent or omniscient. It really is sound logic. Apologists then came up with the idea, or as per my memecard, erect new goalposts, that God doesn’t interfere in our affairs because he doesn’t want to influence our Free Will. When doing this they must ignore the many stories in the Bible where God did just that. In the Tower of Babel, he completely thwarts humanity’s Free Will to build a tower to the heavens by knocking it down and confusing our languages. So he’ll stop us from building a tower, but won’t stop a child from being raped? Clearly, new goalposts have been erected since they didn’t say the Old Testament was wrong, so the old posts must still be standing. They do however ignore the old goalposts and do everything they can to claim they were never the real goalposts, claiming they were metaphors or allegories or anything to let them ignore it. You also have Islam, Hinduism, Buddhism, Jainism, Sikhism, Taoism, Shamanism, etc, etc all making their own claims and changing them as needed to dodge sound counter-apologetics. Then you have the atheists. We’d really rather not have to explain why we don’t believe in religious myths, just like we don’t need to explain why we don’t believe fairy tales or professional wrestling is real (for the record, I actually enjoy wrestling, it’s choreographed but so are movies). Unfortunately, because the other teams have so many players, we’re forced to play. We used to be forced to pick a team even though we didn’t want to, but the other players got rather upset and did all kinds of horrid things to people that didn’t join their team. Thankfully there’s enough of us and now enough nice players on the biggest team on the pitch that we’ve been allowed to form our own team. We don’t have any goalposts since it’s hard to falsify disbelief, but we get to kick the ball around now and have so many sound arguments that we keep scoring goals (and they keep erecting new goalposts). All in all, It’s kind of a fun game to play, but we’d really rather end the game, get off the pitch and everyone go grab a beer and hot wings together; and bacon since many of the players have never had it before and don’t know what they’re missing. This entry was posted in atheism, religion, Uncategorized and tagged atheism, atheist, religion on October 3, 2016 by Eh.